William Martin Property Consultants Ltd has acted as designer, contract administrator and CDMC for the alterations and refurbishment of Rowan & Sycamore Wards at Springfield University Hospital. 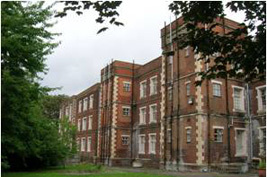 This included the remodelling of the existing dormitories to provide new single and double bedrooms. The works also included the refurbishment of the existing bathrooms/ showers/WCs. Ironmongery on doors has been replaced with new anti-ligature ironmongery. The wards have been redecorated throughout and floor coverings have been renewed in part. Other works included new lighting and modifications to existing staff and fire alarms. Also included was the provision of a new external, secure smoking shelter. A further phase has recently been tendered and involves remodelling of the bedrooms to provide all single bedrooms, new wet rooms with DDA access and the renewal of the existing single glazed metal windows with new double glazed, anti contraband and vandal resistant metal windows.